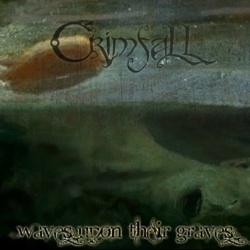 Epic folk metal band Crimfall from Helsinki, Finland will release the “digital only” single “Waves Upon Their Graves”on the 4th of July 2014. It is an acoustic version of the song “Frost Upon Their Graves” from their second full-length album “The Writ of Sword” from 2011. The idea came up when the band was preparing some material for its third album and they realized they haven’t published any songs lately. Inspired by this, Jakke took his acoustic guitar and went through all the old songs, trying to figure out which one would suit the purpose best. The idea was to choose a song and in a way remake it, so the outcome would be something new and different…. not just playing the original version with acoustic instruments. “Frost Upon Their Graves” being such a dynamic song was chosen for this remake. This gave Sara the chance to stretch out her vocals and for the first time their guitar hero Jakke did (tried to do) some background vocals! The final inspiration came from a painting made by Petri Järvinen, which helped Crimfall to find a right mood and theme. Theye decided to use the painting as cover art to illustrate the song but that was all the “outside help” that was used in making of “Waves Upon Their Graves”. As the band states: “this is our own release, which doesn’t involve any record labels or other authors expect the band members. We did this release to show you how grateful we are for your patience while we are making our 3rd album. So “Waves Upon Their Graves” has nothing to do with the 3rd album“.